With a corporate vision of “Building an Evergreen Foundation and Leading a Healthy Life”, Aoyuan actively discharges its corporate social responsibility and has donated approximately RMB900 million to charities over the years. Aoyuan Group actively follows the precise poverty alleviation measures from the Party. It has established Aoyuan Charity Foundation with the aim of “Love from Everyone, Warmth for Everyone”. Through the poverty alleviation and education project of “Double Tens, Double Hundreds”, Dialogue with Mountains and Sea, disaster relief acts and micro-public welfare activities, the county complex strategy has been executed to support the development of social undertakings such as charity, education, sports and health. Due to its outstanding performance in charity undertakings, Aoyuan Group was selected as one of the top 10 “2017-2018 Benchmark Real Estate Enterprises of the Year for Poverty Alleviation in China”. Following Wenchuan earthquake in Sichuan on 12 May, 2008, Aoyuan made a donation of over RMB3 million to help with earthquake relief efforts. 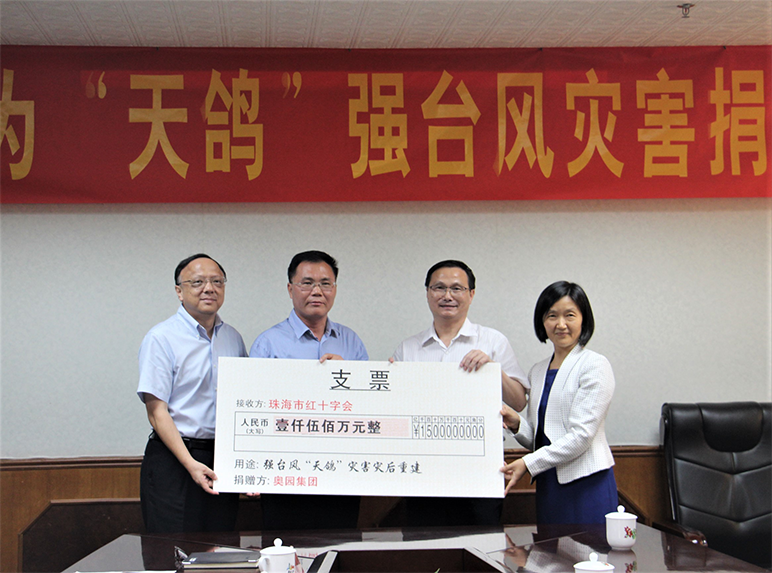 In 2012, Mr. Guo Zi Ning, Party Secretary and CEO, donated RMB3.3million to the Panyu Charity Society on behalf of Aoyuan at the Charity Party of Guangdong Poverty Alleviation Day & Guangzhou Charity Day. In May 2010, Aoyuan made a donation of approximately RMB100 million to Panyu Education Bureau for the construction of Zhongcun Aoyuan School and kindergarten. In 2015, Aoyuan made donations for the establishment of a rural clinic in Luxiyaozu Village, Zhanshi Town, Qujiang District, Shaoguan, to support the Tongxinyuan Project co-organized by Xinhuanet.com, Guangdong Branch and Guangdong Tongxinyuan Philanthropic Foundation. In 2017, Aoyuan Group made a donation of RMB15 million for the reconstruction work after Zhuhai had been hit by a typhoon and was named an “Advanced Group for Disaster Relief” by Zhuhai.